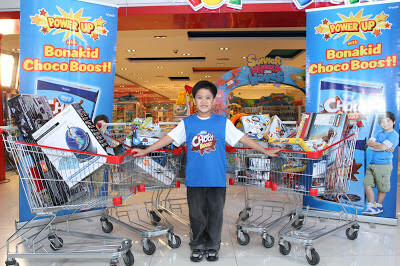 Seven-year-old Kyle Yniguez is the first winner of the Bonakid Choco Boost Amazing Toy Adventure Promo. His father found the winning sticker from the Bonakid Choco Boost box he bought as soon as the promo started. Kyle, who has never won any promo similar to this, was both surprised and thrilled when his father told him that he will have the chance to choose all the toys he wants in 60 seconds. “Today is really a day of firsts for Bonakid Choco Boost. This is the first time that we are holding a toy shopping spree and we are awarding our very first winner. We are very happy for Kyle and we look forward to meeting the other 14 winners who will get to experience an adventure of a lifetime. By purchasing specially marked Bonakid Choco Boost boxes, other children can instantly get gift certificates from Toy Kingdom or the chance to win a 60-second toy shopping spree like Kyle,” explains Bonakid Choco Boost Product Manager Claudine Serrano. An avid Bonakid Choco Boost drinker since late last year, Kyle was able to collect toys amounting to around PHP 100,000 in just 60 seconds. Due to his speed, agility and strategic-thinking, he was able to fill up five shopping carts with his favourite toy brands. Kyle had fun choosing the toys and he also enjoyed the whole shopping experience. Since he is an only child, Kyle is excited to share his brand new toys with his cousins. With high levels of Calcium, Zinc and Iron, Bonakid Choco Boost provides children with the nutrients for optimal growth and development to power up their daily activities into everyday adventures.